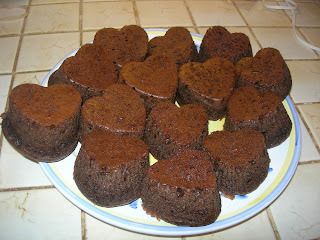 In honor of Valentine's Day, I made some chocolate cupcakes this afternoon. Most of the ingredients, I regret to say, were not local. The eggs and butter were. One other was. The beets. Beets in chocolate cupcakes? you ask. Good question. Since this Summer I have seen a number of recipes for chocolate cake using beets as a secret ingredient. With some beets from Kretschmann's Farm, I decided to try Jessica Seinfeld's recipe from Deceptively Delicious. Thanks, Patti, for the book! For those of you who have not heard of this cookbook, it is based on the premise (that many people have used for years, including my mother-in-law with her zucchini chocolate chip cookies and green tomato pie) that if kids can't see or taste the healthy food and they actually eat it, we are all better off for it. The cook of the family makes vegetable purees from vegetables like squash, spinach, sweet potatoes, broccoli, cauliflower, etc. and either uses them right away or stores them in the freezer. Then the cook adds anywhere from 1/4 cup to 1 cup of this puree into a food one would not normally find this vegetable. And no one is the wiser. Some people have said to me that they do not believe in deceiving their children in this way. I, personally, have no problem with it. Anyone who knows how unbelievably picky my daughter is might understand. Despite my whole-hearted support of deceiving children into eating healthily, a lot of Mrs. Seinfeld's book is useless to me. My son who will eat regular foods will eat vegetables in plain sight. My daughter and other son will not eat many of the foods you can hide things in (some examples of recipes are: french toast, spaghetti and meatballs, oatmeal, hamburgers, meatloaf, mashed potatoes, beef stew, and chicken salad). All my family will, however, eat chocolate cake. I was looking for a way to use my beets anyway. First I scrubbed them clean, wrapped them in aluminum foil, and roasted them in an oven at 400 degrees for an hour (all directions found in the cookbook). I then peeled them with a knife and pureed them. Three beets of varying sizes made about 2 1/2 cups of puree. 1. Preheat the oven to 350 degrees. Coat a 9 inch baking pan with cooking spray. (I made 17 cupcakes instead). 2. In a large mixing bowl or the bowl of an electric mixer, beat the brown sugar with the oil or margarine until creamy. Add the whole egg and egg whites one at a time beating well after each addition. Beat in the melted chocolate, beet puree, buttermilk and vanilla. 3. Add the flour, baking soda, and salt, and beat until smooth. 4. Pour the batter into the pan and bake until a toothpick comes out clean when inserted into the center, 35 to 40 minutes (the cupcakes took 26 minutes). Let the cake cool in the pan for five minutes before turning it out on a rack to cool completely. 5. Meanwhile, make the frosting. Beat the cream cheese with the confectioners' sugar, cocoa powder, and vanilla until smooth. Slice the cake in half horizontally. Spread the frosting over the top and in between the layers of the cooled cake. Refrigerate in an airtight contained for up to 4 days. Despite all the changes (or maybe because of them? ), the cupcakes came out wonderfully. They are really delicious and there is no trace of the beets. I know that 1/2 cup of beets is not a lot for 17 cupcakes (that's only about 1 1/2 teaspoons per cupcake), but it's better than nothing and we were all planning to eat sweets today anyway. . .